Leaves, sticks or trash may end up collecting on your lawn over the late fall and winter. Sometimes this material gets matted down on the lawn with snow and rain. Raking or blowing off the material allows for the full effects of sunlight to awaken your grass. A clear lawn also allows your first lawn application to achieve full results. Have you had recent seeding done? Sometimes seeding or over-seeding is done to lawns in the late fall (after the last applications) or early spring. Please let us know if this is the case on your lawn. Our early spring applications contain pre-emergent which will prevent grass seed from germinating. Contact us via text at 260-489-2500 or email customerservice@crownandblade.com so we can make a note in our system and adjust your first application to exclude pre-emergent. If you stick your hand straight down to the ground after mowing, the tops of the grass blades should come to around the spot where your finger meets your palm. The higher you mow a grass plant, the deeper the roots. Deeper roots mean a larger reservoir from which to draw water. Almost all turfgrass root growth for cool-season grasses is in April-May and October-November. Additionally, cutting your grass too short allows greater exposure of the areas between the grass plants which creates openings for weeds or moss to develop. 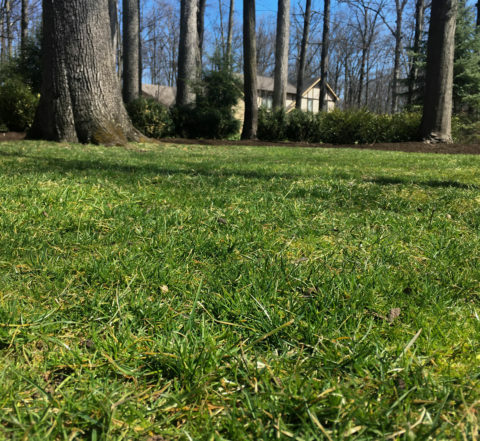 If you have any questions or would like to discuss the best ways to prepare your lawn for spring, call us at 260-489-2500, contact us via our website at crownandblade.com, or simply reply to this post. We think we had fall reseeding and overseeding done. Do you have that info on our lawn in your system? Thanks! We will make a note of that. Thanks so much! Please contact us about our lawn. We have several weeds and lawn is new. Definitely! I know you had a chance to speak with Troy yesterday. Thanks for reaching out!